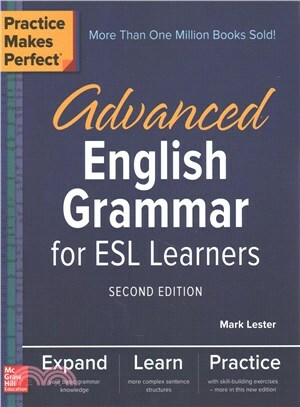 Take your English Grammar skills to the next level and speak with confidence! To fully understand how to speak English effectively you must move beyond the fundamental principles of grammar and tackle more sophisticated sentence constructions. Practice Makes Perfect: Advanced English Grammar for ESL Learners focuses on intermediate- to advanced-level topics to help you create more complex, meaningful sentences and communicate more naturally. Mark Lester is an experienced grammarian, ESL expert, and professor emeritus of Eastern Washington University. He was the founding chairperson of the ESL department at the University of Hawaii, considered one of the best ESL programs in the United States.